Spend a day exploring Victoria’s glorious Mornington Peninsula and discover its rich heritage, natural gems and award-winning wineries. Make the most of your private guide and driver, and tailor your itinerary to your interests, stopping for tours and wine tastings at boutique wineries like Crittenden Estate and Paringa Estate (extra costs apply). 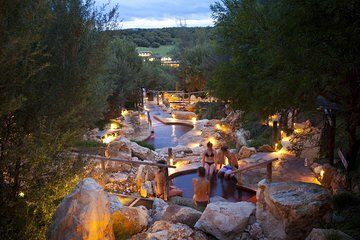 After a delicious lunch at a local restaurant like Tuck's Ridge Estate or Olive Grove (own expense), relax and unwind at the Peninsula Hot Springs.